BEIRUIT (CNS) –The release of at least 12 Greek Orthodox nuns who were abducted in Syria in December was an answer to prayers, said regional Catholic officials. Melkite Patriarch Gregoire III Laham said March 10 that he felt “a wave of joy” along with “thousands and thousands” of other people when he heard the nuns had been freed a day earlier. 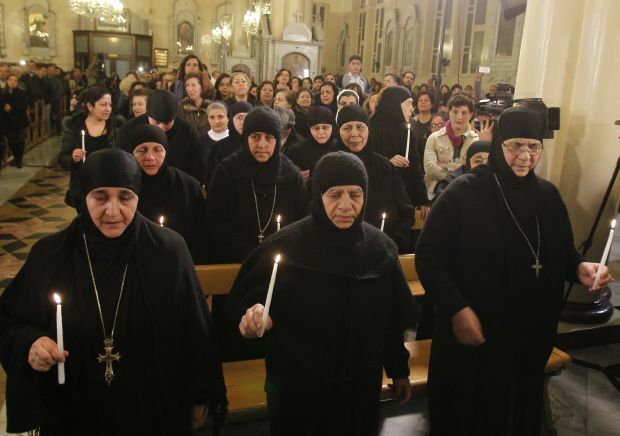 Islamist rebels claimed responsibility for the abduction of the nuns in December from Syria’s ancient town of Maaloula, where Aramaic, the language of Jesus, is still spoken. A video on the nuns’ release can be found here. Two Orthodox bishops and three priests, including an Armenian Catholic and Italian Jesuit, also have been abducted in Syria and remain missing. “I hope the initiative to release the sisters will be a door for more efforts to liberate the two bishops and also the priests,” Patriarch Laham told Catholic News Service from his patriarchate in Rabweh, Lebanon. In Damascus March 10, Christians gathered at the Greek Orthodox Church of the Holy Cross for a prayer service of thanksgiving. Reports the nuns had been liberated coincided with the release of a new Save the Children report showing Syria’s ongoing civil war was taking an even larger toll on the country’s young than previously thought. The report, “A Devastating Toll,” said that in addition to the estimated 10,000 young who have already perished in the 3-year-old civil war, thousands of Syria’s children were dying due to their country’s destroyed health care system. “It is not just the bullets and the shells that are killing and maiming children. They are also dying from the lack of basic medical care. Syria’s health system has been devastated,” said the report. As a result, it said, increasing numbers of Syria’s children were suffering and dying from diseases that would have previously either been treated, or prevented altogether.